By mid afternoon it’s already starting to get dark at this time of year. A lot of people decide not to learn to drive until the days are getting lighter. What with Christmas around the corner it’s tempting to put off those driving lessons until next year. Don’t be so hasty, let’s have a look at some of the challenges of learning to drive in the dark. In a city like Nottingham it can get very busy come the late afternoon but don’t worry, you’ll always start your lessons in a quieter area. The glare from the headlights of oncoming cars can take some getting used to at first. The trick here is to not look directly at the cars but look to the space in front that you are driving into. Take special care to look for cyclists and motorbikes as they filter through the traffic. They can be hard to pick out at night. Sometimes brake lights can be a problem, especially when everyone is slowing down on the approach to junctions. 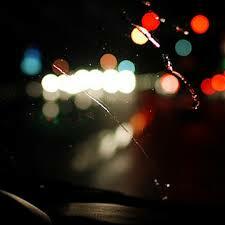 If your windscreen is wet with rain then they can cause a fair amount of dazzle. Make sure you’ve got the wipers on a good speed to keep the windscreen clear. Dazzle from brake lights can be a strain on the eyes and make you feel tired after a while. If you use the handbrake and come off the foot brake you will avoid dazzling the person behind and make things more comfortable for them. The rear view mirror has an anti dazzle feature that you should use. By moving the tab at the bottom edge of the mirror you can cut down on glare from cars waiting behind you. Make sure you put it back to normal when the car behind has moved in order to see clearly again. The anti dazzle feature cuts out a lot of visual detail. Starting to drive in the light as darkness falls during the lesson will allow your eyes enough time to adjust naturally. If you have just left a well lit building then it will take some time for your eyes to become accustomed to the changing light so be aware of this and take extra care. Lower your speed a bit until you can see properly. Driving instructors teach in the dark. Be careful how you use the indicator stalk. Many cars have the main beam switch on the indicator stalk and if you push it the wrong way accidentally you may dazzle other drivers. The flashing of the main beams may be taken as a signal that you are giving way to other drivers and could be dangerous. Handle the stalk with care and you’ll avoid this problem. Pedestrians and other vulnerable road users are at greater risk during the hours of darkness. Watch out for pedestrians in charge of animals. It’s easy to miss seeing them at crossings when you are learning to drive and concentrating on other things. Cyclists should wear reflective jackets but many don’t so keep your eyes peeled for people on bikes. It’s a good thing to learn to drive in the dark. You will gain confidence and experience which will make you a safer driver after passing your test.